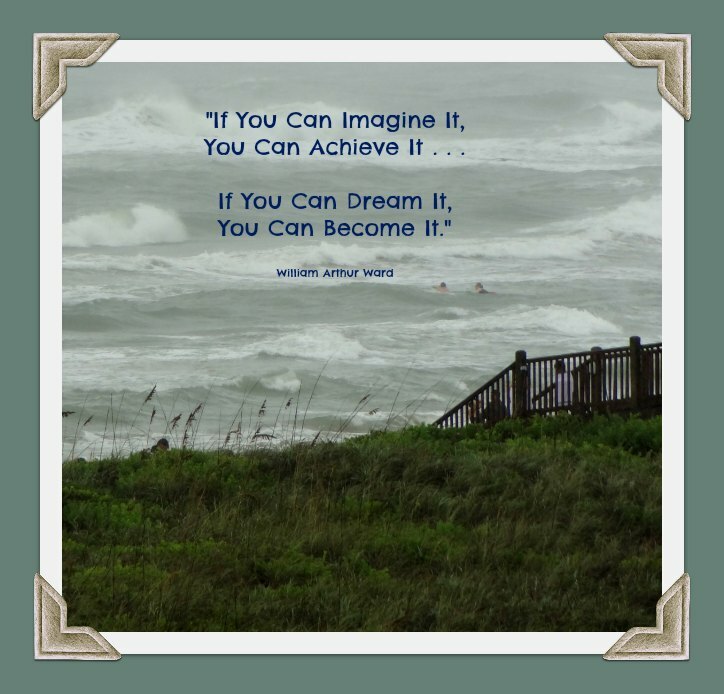 Service business opportunities and trends are plentiful today and a terrific option for new business owners who want to start small and grow their enterprise. These businesses provide a great deal of flexibility -- allowing you to start small or part-time and grow your business into a full-time profitable venture that can support you and your family. A service business can also provide you with the flexibility to work when you are available and coordinate your personal commitments with business meetings and appointments. Many of these service businesses lend themselves to more work-life balance. If this is important to you and your family, you may want to consider how this can work in your own life and what you are willing to do for your business along with how it fits with your other commitments. Of course, these businesses can also be scaled-up and started full-time and with additional capital to get the business up and operational faster than starting small on a shoestring budget. This, of course, increases the risk to the owner. Service businesses generally have lower start-up costs than their manufacturing counterparts which require more capital expenditures due to expensive equipment or infrastructure required to become operational. According to the U.S. Department of Commerce, the industry is providing certain service business opportunities and trends that make this the largest sector of our economy representing approximately 60 percent of our economy or nearly $1.3 Trillion annually in revenues. There are projections this number will expand to about 80 percent of the economy by the end of 21st century. 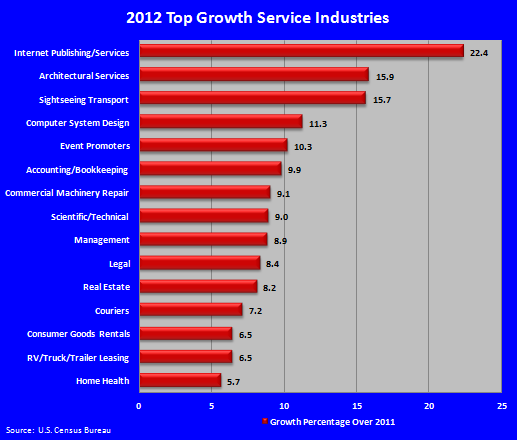 The 2012 Top Growth Service Industries are identified in the chart below. These industries help us identify specific industries where there is consistently strong growth for consideration as we look at alternative service business ideas. 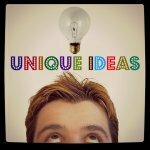 As you consider the variety of service business ideas available, this trend will be huge for the average entrepreneur who wants to start a service business. I now hold as much technology in my hands with my tablet and smartphone as used to be housed in one of the large corporate computer rooms where I worked. These service business opportunities and technology allow us to reach our customers quickly and efficiently without the cost and infrastructure once required for business start-ups. This also translates into the same capabilities for your customers – with over 50% of the cellphone users now owning smartphones and this number is growing daily along with tablets. As you consider your ideas to make money, make sure to factor in the predictable development social media will play in today’s service business ideas. Today there are more personal interactions, building relationships, and learning about one another to develop a Friend-to-Friend (F2F) business role. Communication with our customers will take on a larger role and we’ll need to learn and understand a variety of social media networks, Skype, and how to communicate with our customers publicly. The companies who can do this best and provide value to their customers will be the winners in the service industry of the 21st century. Markets used to be identified by locale, gender, age, etc. Corporations “assumed” they knew who they were marketing to and where they were located. As you study the service business opportunities and trends, define existing markets where individuals organize themselves into groups by interests (e.g. hobbies, skills, interests, etc.) or relationships (e.g. families, singles, couples without children, etc.) where the age/gender mix of your market may be very diverse and they might be located throughout the world. 1. Emergence of “Cloud-Based” Solutions. “Cloud” computing is basically the use of both hardware and software computer solutions which are provided over the internet. With the popularity and technology of the internet along with mobile technology trends, use of the “Cloud” and practical/inexpensive applications are becoming increasingly more user-friendly for handling a variety of functions efficiently using the internet. Research whether there are “cloud-based” platforms or service business opportunities in your industry that can functionally change the way you respond to or provide services for your customers. Think about whether you can get in on futuristic technology which provides your customers with greater virtual options and deliver better solutions than other similar options which are on stand-alone computers. One example for the service industry is web-based software that allows your customer to book their own appointment(s) at a convenient time for them (like the middle of the night when you're tucked in bed) rather than waiting until 8-5 when you are working. As you operate your small business, you’ll be in a unique position to quickly and efficiently align with your customers, get to know them, to provide helpful action, and maximize your service business opportunities to identify additional products/services which enhance their experiences with your business. It will be much easier for you as an entrepreneur to develop effective solutions through consistent interactions with your customer base than for an established corporation who has employees removed from customers, requiring Board of Director meetings to decide when/how often they will satisfy the requests made by their customers and under what circumstances. As you learn about the needs of your customers, you’ll be able to quickly develop your service business ideas to take action and meet those needs by developing special packages or a collection of services to meet their interests. Determine if your customers need a generalist or a specialist in order to satisfy their requests. Continue to develop your own collection of services or partner with other small businesses to provide a whole host of services for a complete solution to the needs/desires of your customer base. As stated previously, service business ideas generally require a smaller capital requirement to open your doors for business. Some of the costs will be dependent upon how much of the initial business equipment you already own and can put to work in your business endeavor. 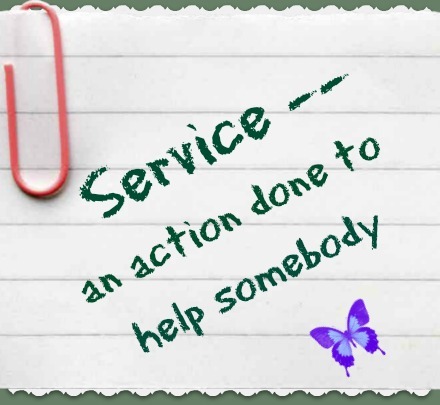 The beauty of many service business ideas, is they can be started from home or part-time giving you the opportunity to grow them over time and replace your current income (if you choose). In addition, there is much less financial/business risk with small service businesses than larger businesses requiring greater investments of time and money. Today consumer expectations have been set by a variety of high-quality service companies leading the way and educating customers to demand more for their money and support. This trend is increasing expectations regarding quality service and is setting a high level for desired outcomes wanted from other companies and industries. We’re already observing the technological requirements to meet our customers where they are -- whether they are contacting us via telephone, email, social media, Skype, or other means. Businesses are required to respond rapidly – usually within minutes and many times with easy-to-use computer applications. As I’ve written previously, the days of waiting 2-3 days or weeks to contact your customer are gone. There is an expectation your response and action will be quick and the norm. If you are unable or unwilling to respond promptly to your customers, they will quickly move on to your competition to meet their requests. Consumers will be looking to you to provide high-quality, complete, organized recommendations and solutions. This will provide you both the opportunity to ask questions, identify requirements, recommend solutions, and anticipate follow-up services you can provide to grow your business. Get to know your customer and establish the Friend-to-Friend (F2F) relationship, be interested, learn about what they currently want/need, what their future service requirements might be (based on your industry knowledge), and how you are the best qualified to meet their requests. Listen (both through face-to-face conversation and social media) to what your customers are telling you. They will be much more likely to engage and work with you as you present complete service business opportunities, solutions, and recommendations than if you are just “marketing” stuff to them without understanding their needs. When developing your service business opportunities and ideas, continuously be involved with your customers, identify areas where you can exceed their expectations with your specific benefits, recognize genuine partner opportunities with other small business owners to provide value-added complementary services, and continuously develop win-win solutions for everyone associated with your service business. 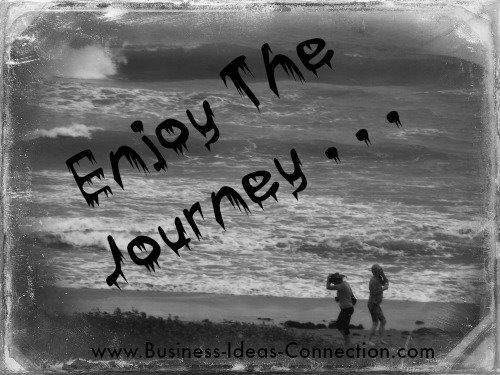 Service Business Opportunities & Trends Back to Online Business Ideas . . .